While I am working on some new recipes – a couple great salads! – for the blog this week, I am gonna make sure all of you out in blogville know about some things that are happening! 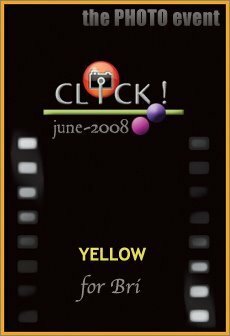 – Jugalbandi is dedicating the current edition of Click – an online photography contest – to raised money for Bri over at Figs with Bri. She has been fiercely battling cancer and the contest is doubling as a fund-raiser to help counteract her staggering medical expenses. You can take part in the photo contest – with the color Yellow as the theme – and make a donation here. – If you haven’t been over to MeleCotte, a food blog run by Chris, you should do so! She has started pastry chef duties at a local restaurant here in Atlanta…and has been chronicling the trials and tribulations of getting her tasty desserts off the ground. I will be meeting up with her tomorrow (we live in the same city and have never met!!) to take some shots of her creations. – For those folks in Atlanta, I wanted to make sure you knew about a very special wine dinner happening at Ecco, one of my favorite spots in town. The Fresh Flavors dinner will be happening on June 24th at 6:30 pm. The vegetarian tasting menu will be paired with wine for $50 per person. I have made reservations for this as my birthday dinner – well…the dinner on my actual birthday! – Please be my friend! Running with Tweezers (and myself) are all over the Internet! We want to get to know you. You can be my friend on Facebook (we even have a Running With Tweezers group!) or Myspace. I take lots of photos – of food and otherwise – which you can see here on Flickr. Lastly, you can also take part in all the fun banter and "tweeting" by following me on Twitter – there are a lot of great food bloggers using the service. Thanks so much for publicizing this amazing grassroots fundraiser. I am truly grateful for all the support of the blogging community.